PDF to Image(JpegJpgTiffBmpEpsPs) Converter is a batch image converter that convert PDF documents to image(JpegJpgTiffBmp EpsPs). It is the fast affordable way to convert a lot of adobe PDF files to popular image format once time for saving your time! 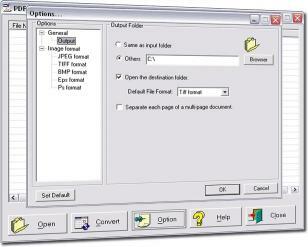 Its easy-to-use interface allows you to create Image files from PDF documents by simply few clicks. It supports batch converter mode. 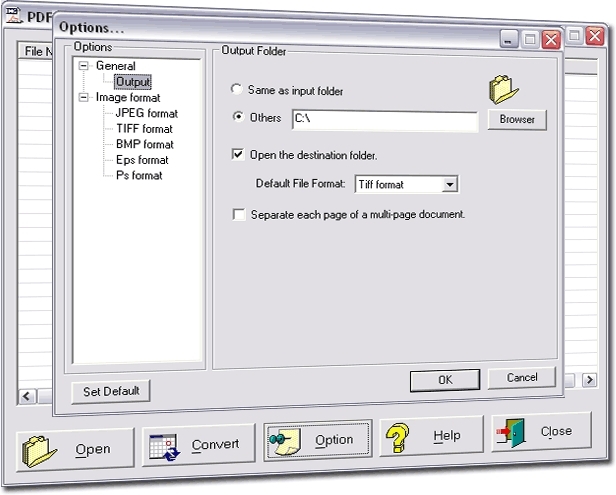 Creating documents which can be viewed on any computer with a Image viewer. PDF to Image(JpegJpgTiffBmpEpsPs) Converter lets you instantly convert Adobe PDF acrobat documents into fully-formatted and professional-quality JpegJpgTiffBmpEpsPs file format.Using PDF to Image(JpegJpgTiffBmpEpsPs) ConverterStep 1: Add the Adobe PDF documents to the file list. Step 2: Chick Options button in the toolbar to open Setting dialog. From here you merely need to change the entries in the GUI to suit your needs and the Image File will be produced according to your specifications. Step 3: Chick Convert button to convert the documents to Image. It supports conversion into High colors (24 bit)Greyscale (8 bit) JpegJpg Format.It supports conversion into Multi page High colors (24 bit) TIFF Format.It supports conversion into Multi page Middle Color (12 Bit) TIFF Format.It supports conversion into Multi-page 2 colors (BlackWhite) TIFF Format.It supports conversion into True Color (32 bit) BMP Format.It supports conversion into Level 11.52 EPS Format.It supports conversion into Level 11.52 PS(postscript) Format.It supports batch convert mode.It supports separate each page of a mutli-page document: When you want images of each page of a multi-page document. You can separate each page of output in a series of similarly named files.